It's official. 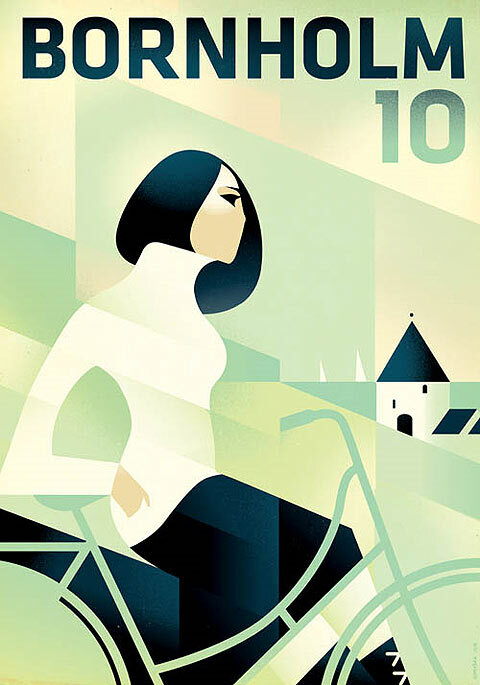 Mads Berg now ranks as Cycle Chic's favourite Danish illustrator. We love pretty much everything he does, but we go just a little bit weaker at the knees when we regard his timeless illustrations of that iconic cultural figure - The Cycling Girl. 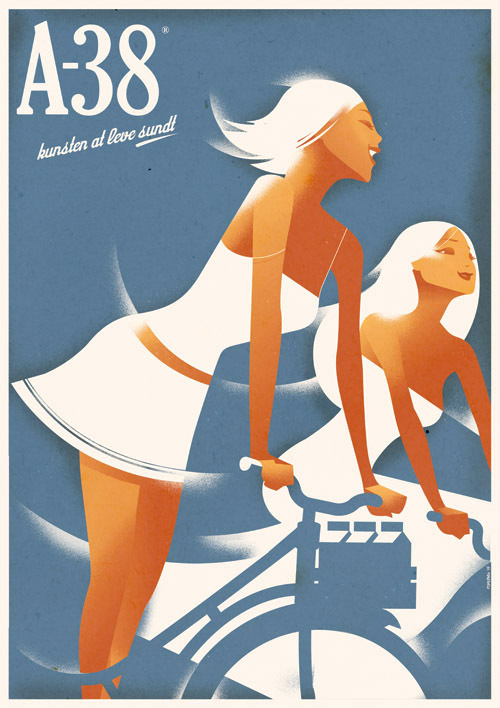 She's as old as the bicycle itself and yet Mads Berg succeeds in reinventing her and adding new layers to the long history of Cycling Girl graphic design. And that's saying something, considering the wealth of material over the past century. 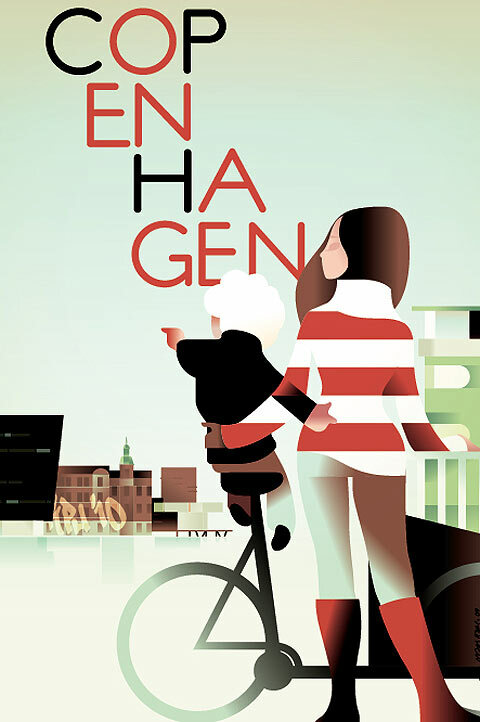 The illustration above is classic Copenhagen and features another icon - the Christiania cargo bike. Bornholm 10, 2010. Poster/cover illustration for the island of Bornholm. Here's an illustration for tourism on the Danish island of Bornholm - the Sunshine Island. 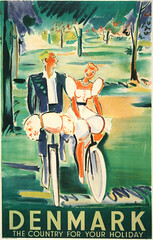 We've blogged about this illustration before here on Cycle Chic. A campaign for a yoghurt. 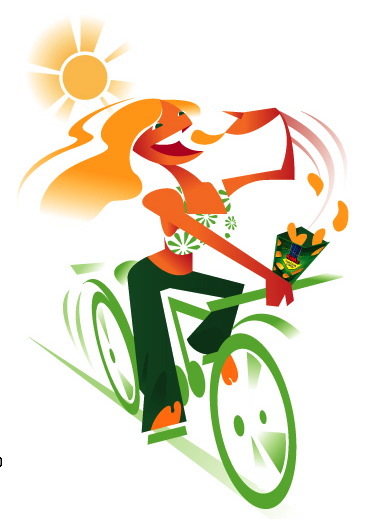 Illustration for packaging on KIMs crisps, 2003. This is an illustration for some crisps from 2003. Our new affection for Mads Berg doesn't mean we're giving up on one of the masters of Danish graphic design, Hans Bendix. His post-war posters are still iconic and relevant today. 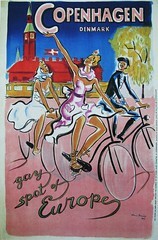 These two examples are tourism posters from the late 1940's. Check out Mads Berg's website. It's a treasure trove of graphic design. And here's a link to his online shop. Men hvor kan man købe Copenhagen-plakaten?? beautiful artwork. thank you for sharing, Mikael. it serves to remind me that i can hardly wait to visit northern Europe again on a cycling holiday. these posters are awesome, i love the old fashioned graphics, and the way the technology of the time made the images look so dramatic. I like everyone, but the third one is my favorite, definitly, the combinatios of girls and bikes are great, and the graphic style is wonderful. Timeless. I suspect the newer ones will look just as good as the two older ones when they reach the age of 50 years.